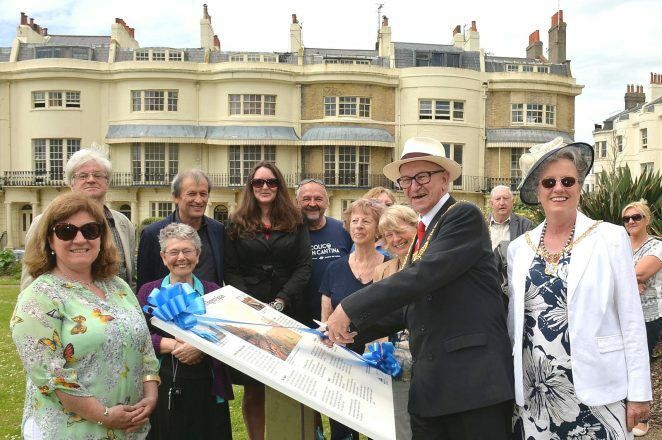 The Mayor of Brighton and Hove, Councillor Brian Fitch, accompanied by the Mayoress Mrs Norah Fitch, cut the ceremonial ribbon this week on the new Regency Square Heritage Board. 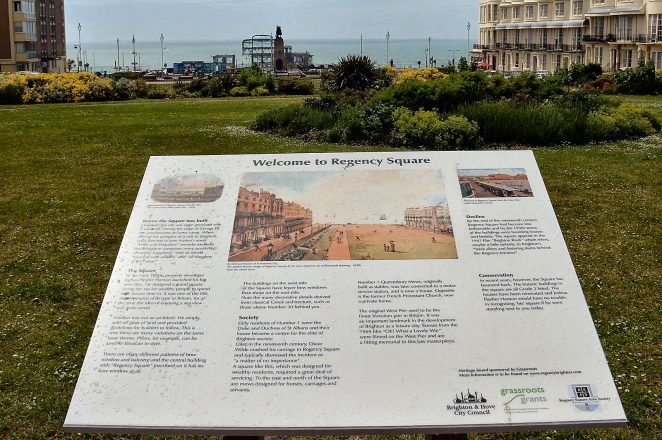 Funded largely by a grant from the Grassroots organisation, with contributions from the Regency Square Area Society, and Brighton and Hove City Council, the board charts the history of Regency Square over the last 200 years. In his welcoming address, the Mayor reflected on the changes that Regency Square has seen, including the construction of the West Pier, the arrival of electric street lighting, an underground car park, and now the prospect of the i360 viewing tower. He complimented local residents on the fine appearance of the gardens and houses today, and recalled a time when our city’s architectural heritage was not so valued. Councillor Fitch acknowledged the role of local groups such as the Regency Square Area Society, in preserving our historic buildings and spaces. Click on the image below to open a large version in a new window.